Sleep disorders affect millions of people worldwide and power a multi-billion dollar industry that thrives on selling sleeping pills. The problem with sleeping pills is that, although prescribed by a medical doctor, they often present undesirable side effects. We offer an alternative to prescription drugs by providing natural sleep aids that are safe and effective. They encompass a wide range of approaches from aromatherapy and light therapy to herbalism, sound therapy, and vibroacoustics. Besides helping with sleep, sound therapy provides great relief from tinnitus. One-Size-Fits-All mask covers ears and eyes, for males and females. 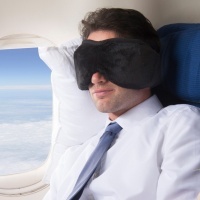 One-Size-Fits-All "Dual Use" Total Sleep Mask System cover ears and eyes, for males and females. Specially designed ear packs reduce sound from snoring, CPAP machines, airline noise, noisy roommates and neighbors, barking dogs, coughing etc. Ideal for home, travel, meditation, and dorm room to get a good night's sleep and wake up feeling rested and refreshed. No-pressure eye guard to block out 100 percent light with zero pressure on eyes, and no smudging of eye make-up. Ear packs can be removed from pockets for easy washing. Bamboo blend fabric on the inside of sleep mask is environmentally friendly, extremely soft and wicks away moisture for ultimate comfort. The velvet-like material on strap keeps straps from pulling or tangling your hair; designed for durability and comfort. Earplugs included. Ear packs and earplugs provide greater sound reduction than earplugs alone. Keeps earplugs in place. Audiologist tested. NOTE: Due To Health Restrictions, This Product Is Non-Returnable!